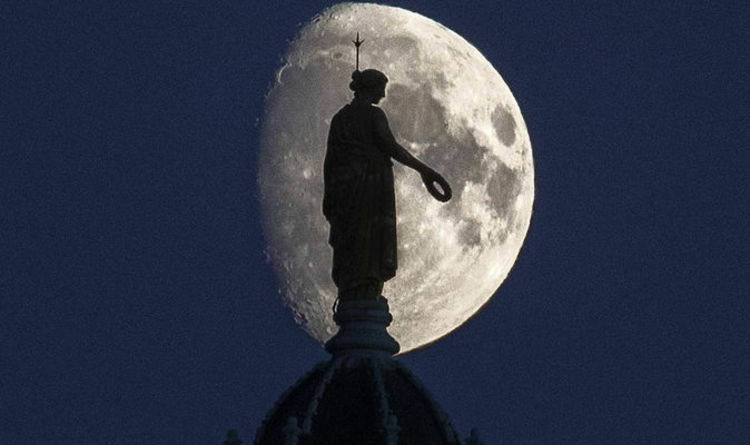 The UK is basking under the glow of a Full Moon today, the first to show its face in November. A Full Moon’s majesty has been celebrated since ancient times, when communities ran off the Lunar calendar. As such, this particular Full Moon earns special significance, and is known the Beaver Moon. The Beaver Moon isn't normally visibly spetacular, but will be a sight to behold in the UK this year. Where can you see the Full Moon? Today’s Full Moon is visible in the UK, from the south to as far north as Scotland. Whether the Moon is full or not depends on its position in relation to the Sun and the Earth. As the Moon orbits the Earth, different parts of the satellite are lit up depending on where the Sun settles. READ MORE: Why is the Moon so big tonight? The dark side of the Moon is the part facing away from the Sun, and as certain parts of the Moon become further encompassed in sunlight, the Moon runs through phases. When the side of the Moon most lit up by the Sun is facing a country, residents will see a Full Moon, the final phase. Today’s ‘Beaver Moon’ is named so as ancient cultures would use the first appearance of the Moon in November to set their traps to hunt beavers. This year’s is also special as the Moon is starting ‘Perigee’. Perigee refers to the point in the Moon’s orbit when it is closest to the Earth. Those in the UK will see the natural satellite slightly enlarged, as Perigee is just beginning, but still an unusual sight. Moonrise today was at 5.39am, so most people will not have been able to gaze on the sight until now, but during the night it will be the most beautiful. Photos have shown the Moon looming in the sky in stunning detail, especially in the north, where the skies are clear for the night. READ MORE: When is the New Moon and Full Moon this month? However, those wanting to see the Moon may want to keep inside and look through the window, as the weather forecast is looking at low temperatures and heavy rain in some areas. Temperatures in Edinburgh, despite being largely cloudy, are threatening to drop low to around 5 degrees. In the south, there are weather warnings, as the Met Office has set out a yellow weather warning for rain. The southwest - including Bournemouth and Plymouth - likely won’t be able to see the Moon, as flooding of homes, businesses and roads from heavy rain is expected. This is is likely to continue until Saturday November 24 at 6pm.